Our Mr. Pasha joined us 13 months ago, just before the winter storms hit. At 12 1/2 years, he was a most beautiful dog, so loving, so gentle. We had no idea how lucky we were to have him join us in the garden. Mr. Pasha came in the house and quickly learned where to nestle, and more importantly how to snag a prime cushion before someone else got it. 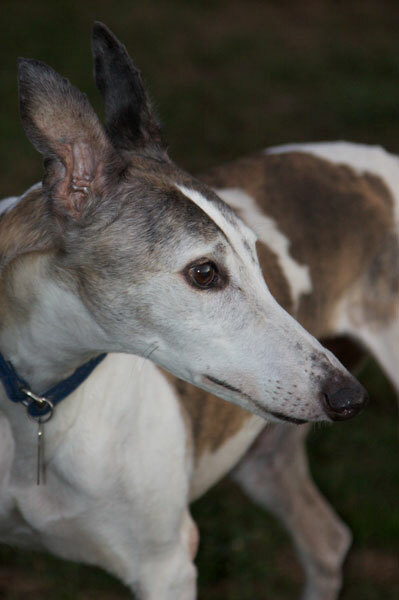 In typical greyhound fashion, he accepted his new digs quickly and loved life in the garden. Before long, he was telling all of the other greyhounds how it should be and how it was going to be. More than anything, he loved roaming around on the acre. He took care of business right away and spent the rest of the time taking in all of the smells. He got along with everyone, but he really love the girls. In fact, he lived for the girls. I can still see him running along the fence with all of the other dogs. We’d hold our breath for fear he might get hurt, but he loved racing with them and life for a greyhound is all about quality. His time with us was way to short and we will miss him more than he will ever know. He truly was one of the best dogs ever.